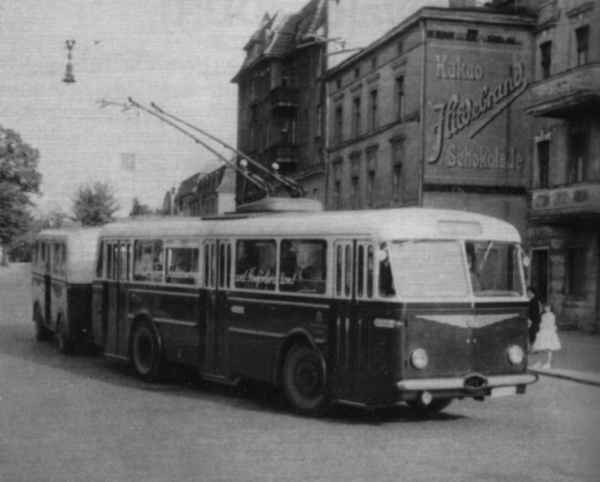 Starting from 22th January 1959 resulted again a substantial breakdown of the trolleybus traffic in Eberswalde. A truck had broken in with an axle into the bridge roadway when driving on the railway bridge. Thereupon the railway bridge was, the only direct connection between Westend and town center, closed as a result of engineering deficiencys for the total vehicle traffic. With it was the only east-west connection of the city Eberswalde and consequently also the trolleybus lines to Westend interrupted. The traffic was redirected over Britz and the level crossing at the Tierpark (zoo). Only pedestrians were allowed to cross the railway bridge over an auxiliary construction from wood. After the trolleybuses were turned over the railway station forecourt with tractors, could be already taken in operation the short-termed built trolley system turnaround loop at the railway station forecourt end of January. A LOWA trolleybus-trailer combination, predominantly trolleybus no. 8II, operated in shuttle service between Westend and railway bridge during this time. Also there a trolley system turnaround loop had been built around the street refuge at the goods station. The LOWA trolleybus with trailer, used in the shuttle service Westend-railway bridge, was placed at the night if closing hour in a factory annex of the dwelling house at the station Eberswalde West with the help of a truck. For maintenance the LOWA-trolleybus was dragged over the at that time unfortified Wildparkstraße and the level crossing at the Tierpark (zoo) to the depot. After there were many a time problems in the dragging, especially through getting stuck of the tow train on the unfortified Wildparkstraße, the shuttle service railway bridge-Westend has been carried out later with a from Berlin borrowed motor-bus of the GDR type H6B. The passengers had to get off at the main station and to cross the railway bridge to foot, in order to get in again to the other side waiting trolleybus later motor-bus. For this interrupted trolleybus traffic special collecting tickets were printed. On these tickets the field for the cancellation was divided diagonally, a punching for the section Westend-railway bridge and one for the section main station-Ostend alternatively Nordend. On the 29.September 1960 the in the meantime repaired railway bridge was released again for traffic and the interrupted trolleybus traffic to Westend could again continuous resumed. The photo shows the trolleybus no. 9III of the Czech type ŠKODA 8 Tr6 with trailer shortly before the east ramp of the railway bridge turning to the left from Eisenbahnstraße on the railway station forecourt.